We have now added support in the CRM for Google Apps - iFreeTools CRM, to directly importing Contact entries from your Google Contacts into your CRM database. 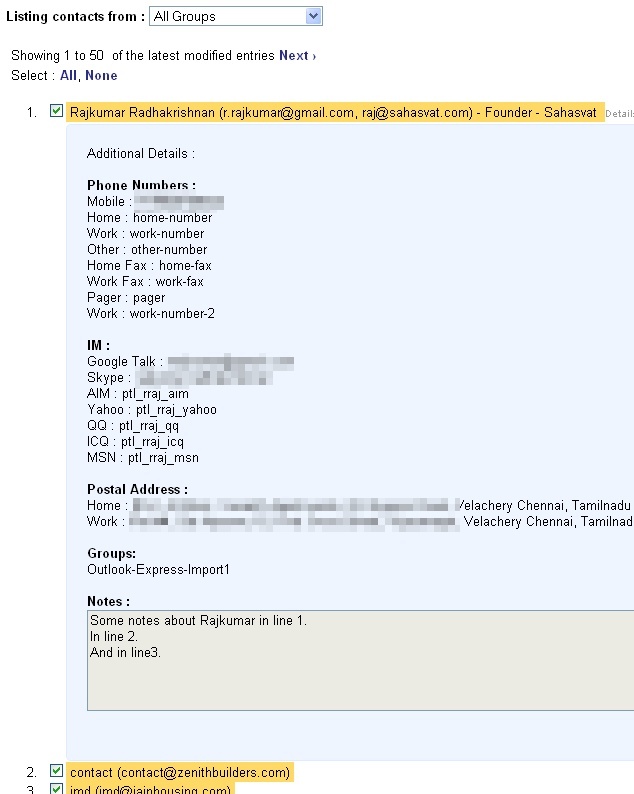 In all contacts list views, you will now have an option to "Import from Google Contacts". Clicking on this, Google will prompt you to ask if iFreeTools CRM can be allowed access to your Google Contacts. Once you provide access, you will be redirected to your list of contacts from Google Contacts, from which you could selectively mark and import into your CRM database. You will have options to list contacts based on Contacts Groups you had assigned in Google Contacts, change the sort order (by default the latest updated entries are listed on top) and the page-size (default : 50). If a contact is already found in the CRM database, it will be skipped during add. But you could change this behavior to either add a duplicate record or to over-write the existing record with values from Google Contacts. The following snapshot shows the options available during import. Here "random" is one of my Google Contacts groups. 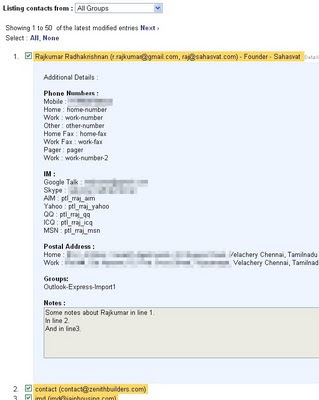 You can also preview the details of the contact, before you mark it for import. The following snapshot shows such a preview of one of the contacts..
After marking the entries you want to be added to the CRM database, you could then click on "Add Contacts". This will add the marked entries in batches, displaying you the status of the progress. Once added, you could view these contacts in the CRM database. 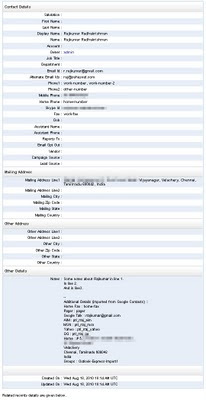 Apart from the standard details, additional details will be added to the Contact record's Notes attribute. 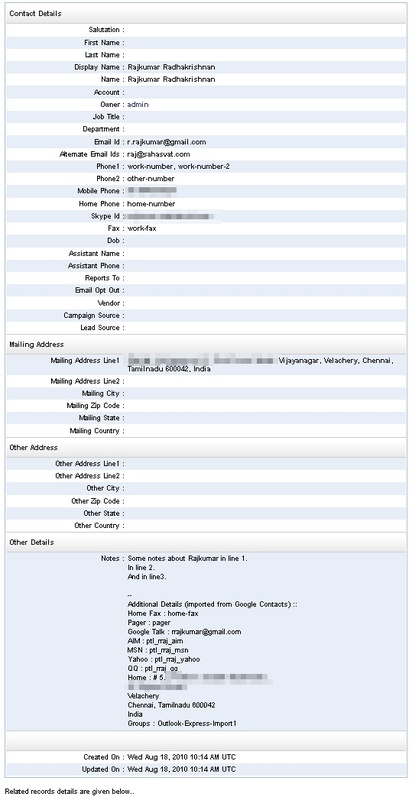 Snapshot of a sample record imported from Google Contacts is given below..
By default, the user who imports the entries will be set as owner for those records. You could use the bulk-edit feature to change values as required. Hope you find our new feature useful. Keep sending in your suggestions on how you think we can make things better & easier for you.